• Publisher, Editor, Writer and Layout Artist for Airplanista Magazine, an online aviation publication serving general and business aviation. 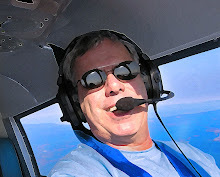 • Nationally-published feature article writer for 36 years with an emphasis on aviation issues, including numerous articles in AOPA Pilot Magazine, InFlight USA, Atlantic Flyer, National Speed Sport News, others. • Frequent Speaker on aviation topics at EAA Airventure Oshkosh as well as regional and local aviation clubs and organizations. • Active member of the Twitter social community, with frequent daily postings of aviation topics, currently with over 1,350 followers including corporate CEOs, major aviation magazine editors and management of AOPA, EAA and NBAA and NATCA. • Judge of the San Francisco Region ADDY® Awards held in Oakland, California. • Exclusive on-board media and commercial photographer for Duggy the DC-3 “The Smile in the Sky” the country’s most popular youth education aircraft team as they participated in the 2010 EAA Airventure Air Show in Oshkosh, Wisconsin. • Published Av8rdan's World of Flying 2005-2010, This fast-growing aviation blog was frequently featured on Google News/Finance Pages as well as McGraw-Hill’s Aviation Week. USA Today requested permission to quote. • Authorized Screenwriter for “Three-Eight Charlie”, a feature film script depicting the true life story of Jerrie Mock, the first woman to fly solo around the world. • Conducted a private photo and video shoot, at the invitation of the Smithsonian Institution’s General Aviation Curator, of Jerrie Mock’s “Spirit of Columbus”, the Cessna 180 she flew solo around the world. This rare closed photography session of this historic plane produced the most extensive series of research images outside of the Smithsonian Collection. • Founder and Director of Development of the Welcome Sky Aviation Scholarship Program, a California 501(c)(3) that generated funds through private contributions and corporate donations to pay for flight training for the next generation of pilots. • Professional journalist/news photographer since 1979, with news articles, features, news and sports photos published in numerous national and regional trade and aviation publications and daily and weekly newspapers. • Since 1999, President, Art Director and co-founder of Celeste/Daniels Advertising and Design, Inc., a full-service creative agency with a specialty in aviation. Also in-house photographer, with specialties in theatrical, aviation and advertising images. Company photographer for Fresno Grand Opera (FGO) since 2003, and of three company photographers for Eugene Ballet Company. • Official concert photographer of FGO’s Andrea Bocelli, Placido Domingo and Josh Groban concerts, including private session artist photography. • Active advanced member of Toastmasters International, a worldwide organization that encourages members to become exceptional presenters, lecturers and public speakers.